Contemporary design inspired by traditional architecture. 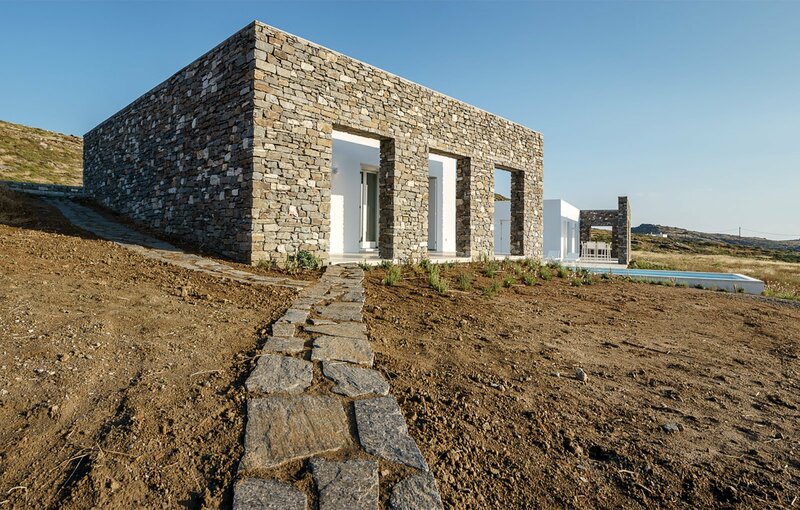 Built on the Greek island of Paros, in a protected area of natural beauty, Hug House blends into the landscape in a creative way. Athens-based studio React Architects embedded tradition in the modern design of the summer house. The practice also created a special relationship between the minimalist retreat and its surroundings. A natural stone wall envelops the two one-story structures, hiding them from the road while also blending them into the rocky terrain thanks to the similar colors and textures. The two buildings boast bright white plaster walls, a contrasting feature that complements the exterior wall which ‘hugs’ the complex. A central courtyard created by the position of the two houses references traditional Cycladic architecture. Nestled in the slope, the summer house minimizes its impact on the line of the horizon. Seen from the nearby road, it almost disappears into the land. Stepping beyond the protective wall, however, guests discover a bright and open contemporary space. A swimming pool and terraces offer a peaceful space to relax. The outdoor area overlooks the gorgeous Naoussa Bay, while windows cut in the exterior wall frame the surrounding landscape. A counterpoint to the white furniture and bright plaster exterior, the stone wall also anchors the two summer houses into their natural setting. Photographs© George Messaritakis.